To go where no Trekkie has gone before. When I first heard about J.J. Abrams rebooting the Star Trek series with another movie outing, my immediate reaction was rolling my eyes. “Not ANOTHER Star Trek movie!” I remember thinking. Indeed, wasn’t that everybody’s reaction? Star Trek lived and had its time, and it seemed like the only people who would enjoy this new release were the Trekkies that were faithful to the series since episode one. Nothing, however, would have prepared me for how immersive and fantastic this new movie is. It’s more than just another Star Trek movie: its a science-fiction epic. It’s an energetic and revamped take on a series that severely needed a new direction. The story is original, the characters are fresh, and the vision is as bold and fearless as it possibly can be. Its success doesn’t just rely on CGI and visual effects (although believe me, it doesn’t fail in either category). It’s one of those rare treasures where the characters and their dialogue is more appealing than the action scenes we have to go through every twenty minutes. The plot originated from an idea that was had way back in 1968. Back when the series was first spawning its popularity, original creator Gene Rodenberry started early writing for a prequel to his own science-fiction series. But just like superhero movies Watchmen and Sam Rami’s Spider-man, it was stuck in development hell until finally creative writing team Roberto Orci and Alex Kurtzman were hired to write the script for the new mysterious Star Trek prequel. This was a smart move. They are the same writers behind movies as successful as Mission Impossible III, Transformers, and Eagle Eye, and their proficiency as writers shines here more than ever. They compose a story as brilliant as it is exciting, a plot that is as action-packed, captivating, explosive, humorous, and in-cheek as possibly can be. They do more than just adapt this universe: they pay tribute to it. They pay homage to the classic series, pulling inspiration and ideas from all corners of the galaxy in the Star Trek universe. We can tell this through tidbits of plot and dialogue that Orci and Kurtzman insert throughout the movie that reveal intimate details of the Star Trek universe we might not have known before, such as how Kirk came to become enrolled in Star Fleet, the origins of Spock, or how James McCoy got his famous nickname “Bones”. This isn’t just another action film where the characters are just shoved aside for the action and explosions: Orci and Kurtzman are just as careful with developing character and dialogue as they are story. Still though, if we have Orci and Kurtzman to thank for the vision, we have director J.J. Abrams to thank for the realization of it. To date, this is only his second time in the director’s chair (his first being Mission Impossible III), but his skills as a filmmaker shine here of blockbuster-esque proportions. Every minute of this film is fueled by both ambition and excitement, with every minute being tense, exciting, funny, exhilerating, and action-packed all at once. Nothing is ever dull or boring or repetitious in this film: every second is filled with character appeal and visual spectacle that hasn’t been matched since George Lucas’ Star Wars series, or recently James Cameron’s Avatar. I cannot recall a single moment in the film where I was bored or irritated. If we’re talking about science-fiction epics, it flat out doesn’t get much better than this. Star Trek is a great movie for many reasons, both obvious and not obvious. The obvious reasons would involve its visual effects, make-up, and art direction. The film is obviously visually ambitious, and like the U.S.S. Enterprise, transports you to many worlds of visual color, dazzle, fantasy, and wonder that is ever-present in the constantly-changing genre of sci-fi. Another obvious reason would probably involve the performances: Chris Pine and Zachary Quinto do a great job at portraying the next-generation versions of James Kirk and Spock, and their chemistry with each other reflects their rivalrous spirit with both great tension and comedy. Eric Bana also, deserves great props as the lead antagonist. 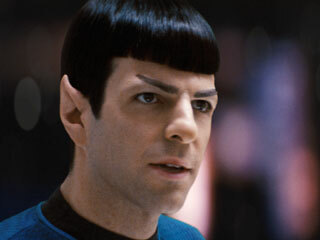 He portrays a villain so passionate and deadly that I pray the Wrath of Khan would never have to face him. But those reasons makes the movie succeed: what makes the movie thrive are the unexpected reasons. And those reasons are writers Orci and Kurtzman and director J.J. Abrams. I’m not saying their careers don’t precede them: I’ve enjoyed Mission Impossible III and Eagle Eye, and I absolutely love the first Transformers movie (although the second one made me want to gouge my eyes out with a toothpick). But the caliber of this work goes far beyond what was expected for them. It’s typical to expect a good product from a good team: it’s rare to see exceptional work of this caliber from that exact same team. Take this from a guy who isn’t a Trekkie. I’ve seen a few episodes of “Star Trek” in the past, but I never became interested enough to follow the series as a direct fan. Watching this movie makes me wonder what I might have been missing out on.